CDXC is the “CHILTERN DX CLUB” for CQ contest entries, not the Clipperton DX Club! It’s a great DX club with a growing international reputation and membership. Membership also gives you access to a special members-only DXcluster. ZM4T is the East Coast Contest group based near Hastings. I’m their volunteer webmaster so blame me for the rather utilitarian site design (curiously similar to this one) and lack of recent updates. ZL6QH is the infamous call of the Quartz Hill contest group based on Quartz Hill just outside Wellington city. This was a fabulous radio QTH, a former government receiving site on a windswept hilltop, so windy in fact that it was turned into a wind farm. While the new site owners were willing to share, it turned out that the switch-mode units converting low voltages from the generators up to the high voltages needed on the grid caused so much radio QRM that the site was no longer suitable for DXing or contesting. Cunning plans to relocate the group to other sites in the greater Wellington region didn’t come to pass, so that’s it for ZL6QH, sadly, the end of an era. ZLCC (ZL Century Club) is an email reflector for active Kiwi DXers. M6T (Martlesham DX and Contest Group) is the UK’s premier HF contest group and a great bunch of contest nuts. The club is QRV from a permanent QTH thanks to the generosity of Bob G4BAH (SK). The Voodoo Contest Group used to activate different rare West African countries in CQ WW CW every year. Members still contest and sometimes travel but not usually to West Africa. RSGB - The Radio Society of Great Britain is the UK's national radio society. The site carries weekly-updated news (including DXpeditions), propagation info , contest info etc. including the text of the Sunday news bulletins. And the RSGB publishes some of the best Amateur Radio books and maps available, including the definitive callsign/prefix guide edited by my pal Fred G4BWP. The monthly Radio Communication magazine carries RSGB contest rules and results, Pat Hawker’s excellent Technical Topics scrapbook and a bunch of other trivia. Oh and the RSGB HF Contest Guide I wrote a long time ago on behalf of the HF Contests Committee. NZART - New Zealand Amateur Radio Transmitters is the national society for NZ radio hams. Their bi-monthly magazine Break-In publishes a few te chnical and operating articles. The Oceania Amateur Radio DX Group sponsored and organised DXpeditions around the South Pacific, including our 2006 trip to Norfolk Island as VI9NI. The chairman and vice-chairman both resigned after a spat over the club accounts in 2010, leading to the club regressing to an unincorporated organization with about 200 life-members. ARRL - Amateur Radio Relay League - the American national amateur radio society. After a few years in the wilderness I rejoined in order to get QST and a discount on my DXCC applications. The ARRL’s books are recommended. The G-QRP-Club’s construction articles and operating tips in the club mag Sprat are well worth the QRP subscription. I always do my best to pull QRP stations from the pileups including those who sign /QRP, where it’s legal to do so, otherwise those who just send [space] QRP, or nothing at all. Sutton and Cheam Radio Society gave me a start in ham radio back in the 70’s, welcoming this schoolboy with open arms into the club meetings at SCOLA (Sutton College of Liberal Arts , annexed to Sutton’s superb public library) and field days at Tadworth and Leek. Andy G4ADM , Mike G3LCH, Colin G4CWH, Mich G8DF (“golf eight dog fox”!) and other radio friends from that era are permanently etched into my brain - a fantastic bunch. Tnx! Leicester Radio Society continued my amateur radio education when I was at uni in Leicester in the mid-80’s. Thanks to the generosity of his family, I was partly responsible for securing the late Jack Hum’s very well known callsign G5UM for the club - one of the earliest “contest calls” in the UK I guess, and a neat way to pay tribute to a great man. Jack was a VHF pioneer , way back in the day when ‘short waves’ were considered useless. Michael G7VJR provides Club Log, an excellent facility for DXers to upload and analyze their ADIF logs. It tells you which and how many DXCC countries and CQ zones you have worked and/or confirmed per band, your league position relative to other Club Log u sers, when are the best times to work the DX, that kind of thing. A huge amount of painstaking work goes into defining the rules to identify DXCC countries from ADIF logs submitted, and to resolve all maner of curious anomalies over the years and I’ve certainly appreciated finding errors in Logger32’s output (thanks to Alan 5B4AHJ, Dave G3NKC and Michael G7VJR). Michael is also CDXC’s webmaster and a keen DXer and accomplished DXpeditioner himself. G3TXF - Nigel is a well known DXer, avid QSLer and QSL collector, tireless QSL manager, oh and UFB CW DXpeditioner. Nigel’s website has searchable logs plus lots of radio photos from his DXpeditions and other jaunts. Nigel always uploads his logs promptly to LoTW giving out numerous “firsts”. His hearing and operating skills are legendary - such a gentleman. G0AFH - Ian is a pal from M6T and Windmill CG ... and a superb photographer. G0MTN - Lee also belongs to M6T and the Voodudes. His site has some great pictures of the West African hotel roof style typical Voodude set-ups. ARGO may be the software that almost everyone recommends for QRSS, but for various reasons the open-source program QRSS VD by AJ4VD suits me better. If you suffer QRM from your computer gear, routers, TVs, toasters etc., read all you ever wanted to know (and then some) on RFI and how to cure it thanks to K9YC. VE7CC’s cluster user software is neat: set up a local cluster on your PC with flexible filtering, LoTW indication and useful other options. Read more here. Having completed a rigorous selection process, I chose K4CY’s Logger32 for my main station log and N1MM for contest logging. Both programs are free and support the ADIF XML log standard, meaning that after a contest I can integrate my contest logs from N1MM easily into Logger32. Read more about the fun I had getting QSL labels out of Logger32 and various bugs in the software here and read K5LAD’s page showing how the QSL label “fields” are defined in Logprint. VE3NEA writes wonderful ham software, some of which is free of charge. The DXatlas program lets the user draw beautiful high-resolution colour maps complete with overlays for CQ zones, country outlines, latitude & longitude or Maidenhead locator grid lines, capital cities, DXCC prefixes, grey lines, propagation prediction (with the associated IonoProbe program) and so on - pretty much anything a serious DXer could ever want from a map program. Mercator projection or great circle projections are no longer confined to the shack wall: the software allows the user to interact with the maps. The globe projection is great for those of us who don’t have the desk estate for an actual globe. Morse Runner is an excellent free program for practicing CW pileups and contests. The sound output is significantly better than those old fashioned CW practise programs - it includes realistic QRN QRM and all the usual crud you experience on a hot and busy shortwave band - including lids who CQ on “your” frequency. Real-time feedback on the accuracy of your log as each QSO is committed to the record is great for improving your contest logging techniques. Its nearly as much fun as a real contest. Get it now, while it’s still freeware! Find out who else is using LoTW at HB9BZA’s site. HB9BZA also provides RXCLUS software to integrate DXcluster spots from various sources (something VE7CC’s Cluster User software also does). SpotCollector is another package in the same vein. A page of info on fixing the Astron power supplies includes links to useful sites on LV power supply design. N7JS wrote about constructing a neat little beacon-in-a-box using the Freakin Beacon memory keyer and Jittle Joe QRP TX. Good job! Step-by-step instructions for making a transformer. Lots of info on SDR from G4ZFQ, with many annotated links to the original sources. Helpful list of Elecraft and user K2 mods maintained by LA3ZA, including those to bring older K2s up to current specs. Here’s a novel way to solder PL259s with screw-in reducers to RG58 or RG8X cable. Peak hold meter adapter is useful for tuning amps while transmitting CW or SSB normally using a peak-reading power meter. I’ve used old Post Office straight Morse keys and homebrew paddles made from junk box parts including hacksaw blades and PCB strips in the past but for at least a decade I’ve been very happy with my Bencher paddle. Happy, that is, until I spied the Begali Sculpture, a beautiful piece of modern engineering art in the shape of a Morse paddle. I yearn for one. I’d probably sell a kidney for one. I’ll definitely have to save hard for one. I stumbled across XQ2FOD Manfred’s website in connection with constructing quiet switch -mode supplies but his photo-essay on constructing a home in the middle of nowhere, powered by a water turbine fed from a mountain stream, is even more fascinating. A Vector Network Analyser by N2PK looks like a useful tool for measuring antennas, tuners etc. - though my MFJ 259 box-o-trix works pretty well too. Lots of construction articles from AD5X. The SteppIR looks attractive for full coverage of all the high bands but reliability of the mechanism is a concern. Log periodics have less gain for the size but no moving parts. Kicad is an open source/freeware electronics CAD system for drawing schematics and PCB designs. It doesn’t do circuit analysis but others do ... I’m still looking. EasyEDA is an online circuit and PCB design tool: do it all in your browser. Elecraft - designers, suppliers and supporters of the K1, K2 and K3, and other neat little kits. The guys behind Elecraft provide a wonderful after-care service as well as producing several of the finest radios ever made. Small PCB-mount 12V relays may not seem ideal for switching QRO RF circuits but some work reliably up to the kW level at 30MHz, cold-switching anyway (RF hot switching can weld or burn away the contacts). The 12A RTB14012F, for example, is used successfully in StationPro controllers (and Ameritron antenna switches? ), while TopTen antenna switches use either the 16A RTD14012 or the JW1FSN-DC12V. The relay coils may need RF decoupling with RF chokes and bypass capacitors, and a small capacitance (5-20pF) to ground should cancel out the inductance of the relay contacts and level the SWR at 10m. W8JI’s sound advice on curing parasitics in the TL922 applies to many other HF amps too - for example making the anode connections as short as possible, ideally direct from the anode cap to the tank circuit capacitors. W8JI also knows how to meter an amp and offers advice on relay timing and relay sequencing and control. What a star! An interesting 1500W HF amp design by K8RA in the ARRL handbook uses a single 3CX1500D7 instant-on ceramic triode, designed to replace the 3-500 (but much more expensively). It uses a computer controlled input circuit from LDI. Label the front panel on your homebrew amps or other gear using Front Panel Designer, a free graphic package designed for that purpose. The GS-35b discussion is basically an FAQ on using the GS35b with loads of useful information on circuit designs and params, including numerous protective elements (e.g. glitch protection diodes), blowers and an absolutely terrifying 1 amp HV test load capable of dissipating 5.4kW. RF Parts supplies the RFC-3 plate choke for RF amps and many other useful bits. Ameritron sell suitable HV caps and other components too. QSK add-on for an amp by AD5X. I’ve been searching for a source of centrifugal blowers capable of maintaining a decent airflow even with back pressure such as these ~90CFM AC mains PAPST blowers. There’s much more to selecting capacitors for an amp than matching the max DC voltage rating. Tony I0JX explains factors such as RF voltage, current and temperature coefficient. A selection of vacuum relays includes Jennings RJ1a, Kilovac and others suitable for RF antenna change-overs, remote antenna switches or for HV safety switching in the PSU. Eimac/Varian Application Bulletin 17 explains the need for current-limiting HV glitch resistors to supplement HV fuses and other control devices to protect expensive valves from destructive high energy internal arcs, in the time taken for the control devices to operate. OE5JFL’s popular HV flashover protection circuit uses thyristors to dump the power supply’s stored energy while an electronic relay cuts the primary power. GD0TEP’s “beta testing” and repair of a commercial 6m GS35b amp includes some interesting comments and good pictures of the mods he had to do to make the amp perform as promised by the rather optimistic advertisements. Finger stock - various types, sizes and prices including gold-plated, no less, and silver plated (for the hi-fi-buffs) - thank W7JK for finding it. Good advice for valve amp home brewers from KK5DR includes design and construction hints, safety advice and more. I’ve printed the 28 pages to use as a reference. Wanted : source for 15-25 Ohm 20-50W vitreous enamel wirewound resistors to use as glitch or flashover protectors for the 3-500s in my LK-550 amp [found! Mouser has them]. HV electrolytics for use in HV supplies are available from JustRadios, though the cheapest ones may not suit the high ripple and heavy loading of a typical valve linear amp HV supply, apparently. The CDE 381LX series snap mount electrolytics have been recommended by experienced amp builders. There seems little point in silver plating coils, except for aesthetic reasons. Different coatings (including normal corrosion) make little difference to the Q of copper wire coils at HF according to careful experiments by W0QE. A research paper concludes that many electroplating techniques produce coatings with worse or at best marginally greater conductivity than the underlying copper! F1FRV on ant changeovers etc. A mighty dual GS35b amp by Joel F6JMT puts out a staggering 3.6kW on 2 metres with around 200W in. Magnificent! Built in a 19” rack unit. That ought to light up the moon nicely. Even a single GS35b can manage 2.5kW output on 2m with a half wave copper cavity built by F1CXX (nice work Franck!). PA0FRI’s site has construction and mod info including a passive R untuned input design for a GU43b amp and notes on reforming HV PSU electrolytics. A big photo gallery of big amps to drool over. Photos plus links to more information on a few GS31b & GS35b grid mounts. A Breakdown Voltage Tester (or Hi-Pot) is a test rig capable of supplying 8~15 kV but at less than 100 microamps. Gradually increasing the volts until current starts to flow indicates the point of HV insulation breakdown. Simple but very useful for testing QRO tubes, vacuum capacitors, relays etc., apparently. Here’s another design in Perspex by K8CU. GS35b dotcom is Tony W4ZT’s site. W4ZT has built several GS35b amps and filament tester/burn-in rigs etc. He sells Teflon chimneys, nice aluminium sockets and a bias board. His circuit design for a single GS35b HF amp uses separate cathode and filament chokes. WB8WJU sells basic GS-35b sockets and chimneys at US$70. Paul G4DCV gets around 950 watts out of a single GS31b on 144 MHz. Nice job! Slovakian commercial 3.5kW HF monster amp using GU78b (needs 2 phase power), also a baby 2.5kW version. Homebrew 3CX3000F7 amplifier by W2DTC describes his 5kV 1.7A HT supply, fusible link and safe connections to the RF deck. Homebrew rf amplifiers and other goodies by WB0NNI starts from basics and includes info on homebrewing HV PSUs and rewinding transformers and chokes plus power transformer capabilities. Homebrew VHF/UHF amps (many) by LZ2US. Project Gamma 1500W solid state amp is a work in progress. RF tube data & application notes from G8WRB includes data sheets on QRO triodes. 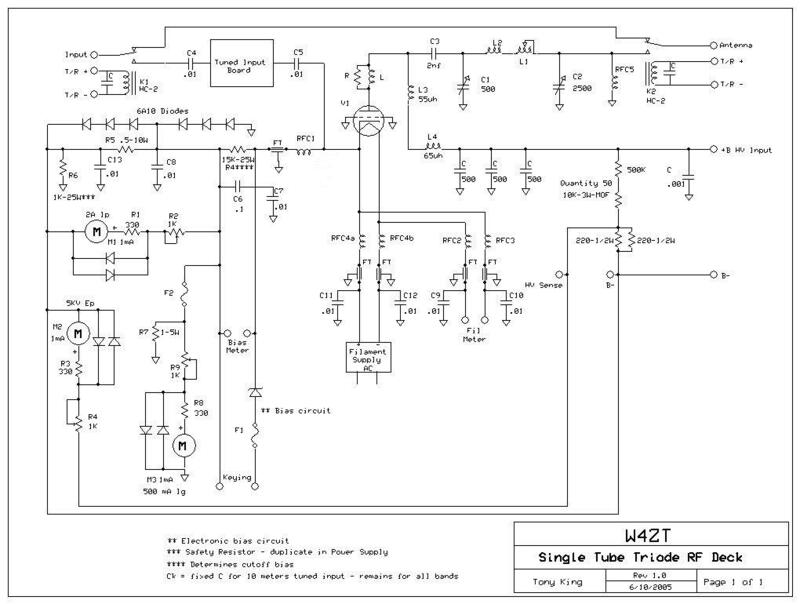 VK8RH’s GS35b PSU controller board has the sequencing logic in a PIC. W4EMF put a GI74 into his GLA-1000. YU1AW has info on many VHF/UHF and some HF amps with GS35b and similar Rusky valves. We should all read and comply with the DX Code of Conduct, plus the IARU Guide to Ethics and Operating Procedures for the Radio Amateur. Help us spread the word to address poor operating standards and selfish behaviours, and clean up the pileups. Join the movement: link to the code from your website or QRZ page. Keep up with current and planned DXpeditions with this list maintained for the uber-cool DailyDX by Bernie, W2UR. WA7BNM, Bruce, maintains the ultimate annual HF contest calendar with info on all the major contests of the year, and a few more minor ones. Sun.exe puts a little sun in the corner of your desktop: hover your mouse over it to see the sunrise and sunset times today. Alternatively, calculate SR/SS times for the whole month, print out the calendar sheet and you have no excuses for missing those greylines. Find out a little about the mega-stations you seem to work in every contest in this database, and think about the immense dedication it takes to keep all that aluminium in the air and watts on the wire. Fly through cool 4D images of the ionosphere courtesy of NASA plus Google Earth. Logbook of The World (LoTW) is the ARRL’s solution for electronic QSLing. To use LoTW, you first need to apply for a digital certificate which authenticates you as a legitimate licensee. Then you digitally sign your log using the certificate and upload it to the LoTW server (I upload my own log, or rather QSOs added since the previous upload, every few weeks). The LoTW database then cross-matches QSOs between you and any of the ~24,000 other LoTW users and generates electronic confirmations that are accepted for DXCC credit. SM3CER website has the best and most up-to-date contest diary plus lots of links. An excellent resource for contesters! Contesting.com has contest tips and links e.g. to the 3830 reflector for bragging about your claimed scores. CQ World Wide is CQ Magazine’s official website for the biggest event in the contest calendar. CQ Magazine’s website is separate. NG3K’s DX and contesting site - an excellent set of useful resources for contesters. HF beacon list - constantly maintained by G3USF. Michael G7VJR has implemented annual DXer leagues in Clublog. CQ Magazine’s DX Marathon is a similar concept except that it is mixed mode and only gives credit for the first QSO with each CQ country and CQ zone in the year regardless of band. Finally, ARRL’s DXCC Challenge rewards QSOs with DXCC countries on each band but is forever, not annual. Logsearch.de is a fast log search engine with a growing collection of DX station logs. In the best amateur radio tradition, it is free to use. I’m pleased to see big DXpeditions allowing near -real-time log searches - it cuts down on the need for additional ‘insurance’ QSOs and hence allows more of us to work the DX. Most big DXpeditions lately have appeared on Clublog. VDA - Vertical Dipole Array - is an effective, lightweight 2 element vertical HF beam design for DXpeditions located right by the sea at the high water mark. The saltwater ground plane is essential. While F4BKV’s design brings the cords holding the lower ends of the wire elements in to the support pole, it occurs to me that if they were allowed to hang vertically from the cross -arm (fixed to pebbles on the beach), the spacing and hence the pattern should be even better. To be honest, a plain vertical does pretty well and I’m not entirely convinced of the value of a 2 element close-spaced array. The sharp rear null may be a drawback as much as a benefit. Here’s a creative way of using a tape measure to make a poor-man’s Steppir vertical. A simple manual version would make a very useful, lightweight multiband vertical for use on a seaside DXpedition with access to a handy palm tree or bamboo cane for support. Broadband amplified mini receive antenna by PA0RDT. I will be building one of these as a diversity receive antenna for the K3, and another for my Funcube Dongle Pro+ SDR. If that doesn’t go to plan, a homebrew wideband HF vertical design by Martin G8JNJ looks good for 40m and up, possibly even 80m as well. With the broadband matching unit Martin specifies, the SWR levels-out at about 3:1 across the range - not much good for transmission but fine on receive and anyway I already have well-matched transmitting antennas. Here’s a novel use for a matching pair of heatsinks: a homebrew HV tuning capacitor for a QRO ATU. The VP6DX gang went to loads of trouble to plan and engineer a superb receiving antenna setup for their DXpedition, and best of all published the nitty-gritty details on their website including bandpass filters designed to allow multiple receivers to share the same Beverages on different bands at the same time. I’d love to build a decent spud gun to get my wire antennas over the tall trees on our boundary, and get some wires high up in the forest canopy. To do that, I need to find a suitable trigger valve ... such as those sold in W6 land. A YCCC article about using common mode chokes to block QRM from miscellanous QRM generators around the house mentions the Fair-Rite site for technical info on toroids and Lodestone Pacific as a cheap source for them (provided you already know exactly what you want). Walter Maxwell W2DU knows far more about antenna matching than I’ll ever know, and writes very well about things such as why SWR up to about 5 on coax is not A Terrible Thing, but common mode current on the coax shield is. Well worth reading. VK5BR designed a “single coil” ATU for balanced or unbalanced antennas on 80-10m, and then extended the design to include 160m and then a QRO version. The “single coil” is actually three fixed coils - no plug-ins. Construction details for 2-wire Beverages from W0BTU includes a pulley arrangement to tension both wires equally: I’m planning to use something similar for the centre feedpoint of my vee-beam array when I eventually get around to putting it up. Here are loads more notes on Beverages including BOGs. Antenna modelling on 160m Beverage antennas by W8WWV. N6LF’s interesting experiments with verticals and radials. G4VGO likes hoisting 160m wire antennas on kites and balloons. LY4A’s site carries DX news including photos of some impressive antennas. W7IUV’s experimental work on 40m 4-squares draws the conclusion that a simple ‘parasitic’ phasing unit with 4 relays works almost as well as a more complicated tuned phaser. He also says that a 40m 4-sq is easy to match on to 30m with a fifth relay and matching blob, and that the element spacing is not critical but using buried radials is. “A four element version spaced at 0.21 wavelength was consistently 6-8 dB better that the two element yagi at 80 feet”. Nice! The Granta contest group, based near Cambridge in G-land, has been busy building contest equipment including an innovative bayonet fitting for temporary antennas (e.g. for use on DXpeditions). My school mentor Colin, G4CWH, is one of the members. Read far more than you ever wanted to know about earthing for lightning protection and RF purposes in a large US DOD manual (contains parts 1 and 2 in the same file). A bunch of links of interest to those building hilltop VHF/UHF repeaters or antenna farms at home. I am astounded to find that if I draw a great circle line to any DX station I contact, a second great circle line to Stonehenge, and a third great circle line between the DX and Stonehenge, those three lines always form a triangle . Spooky! I call this the Principle of Sacred DXing, no doubt long since discovered by the ancients using Magic Crystal Sets. Use a tin-foil hat when speaking on your cellphone. To understand various complicated engineering terms, read this. Add URL: please let me know of other good amateur radio sites and do tell me if you link to this site - I will happily reciprocate! !